Clinical trials to target inflammation in T2D and ASCVD. 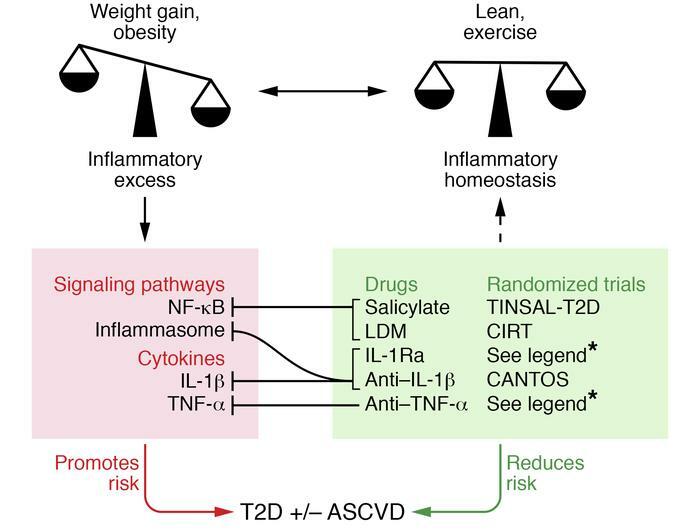 Heightened inflammation that often accompanies obesity or excessive weight gain is a hypothesized mechanism for the associated increase in risk for T2D and ASCVD. Signaling pathways (e.g., NF-κB, inflammasome) and specific proinflammatory cytokines (e.g., TNF-α, IL-1β) have been both implicated in these pathologic processes and are potential targets for reversal and risk reduction. Salicylate and low-dose methotrexate (LDM) inhibit NF-κB as a downstream consequence of AMPK activation. IL-1β blockade mediated by IL-1Ra or specific antibodies inhibits IL-1β action and suppresses IL-1β production by dampening its self-induction; the same effect is potentially true for TNF-α blockade. Randomized, placebo controlled, double-masked clinical trials of salsalate (1–7, 128–132, 134, 137), LDM (8, 144), IL1Ra (9–11, 178, 179, 181) anti–IL-1β (181, 184, 191, 192), and anti–TNF-α (12, 169) are being used to determine whether these antiinflammatory approaches affect disease risk in T2D and ASCVD. Reported randomized trials of 3 months duration or longer are referenced. CANTOS, Canakinumab Anti-inflammatory Thrombosis Outcomes Study; CIRT, Cardiovascular Inflammation Reduction Trial; TINSAL T2D, Targeting Inflammation Using Salsalate for Type 2 Diabetes.